Two bronze medals, two journeys back from the brink, and a pair of performances that smacked with the sweet scent of redemption. Mark English. Ciara Mageean. Two athletes of such rich and rare athletic gifts that to be back here - in Glasgow, standing proud on a major championships podium - felt a whole lot like a rightful return home. 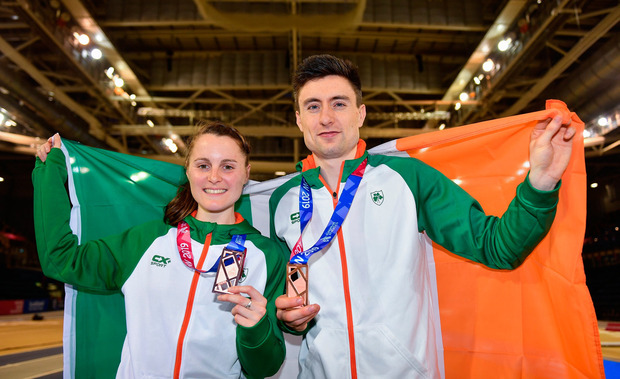 In the space of one magical hour last night, they rescued Ireland's European Indoor Championships, re-establishing the permanency of their class. Not that it was in doubt where it counted - in their minds. To those who had followed their virtuoso ability since their teenage years, their careers always seemed destined for the very highest level. But even ardent supporters must have wondered in recent years if we'd seen the best years of them. English didn't just want a medal here - he needed it. To prove that any predictions about his talent fizzling away into obscurity were premature, that his was a level of class that may be subject to fluctuations in form, but never outright extinction. The 25-year-old threw himself into contention from the start of the men's 800m final, slotting into second place behind early leader Andreas Kramer, and going into the final lap the Irishman was sitting third. With seven men in the final - English was advanced by the track referee after being hampered by a British rival in Saturday's semi-final - he knew where he needed to be: at the front. "The semi was a reminder that there'd be a lot of traffic to weave through," he said. "I knew I had the closing speed so I was looking to stay out of trouble." On that final turn English had to dig deep and churn his way to the line to finish third in 1:47.39, with Spain's Alvaro de Arriba winning in 1:46.83 and Britain's Jamie Webb taking silver in 1:47.13. It is rarefied air he now inhabits, becoming just the second Irishman after David Gillick to win multiple medals at this championships. The next question was whether his mid-career renaissance will continue on an even grander stage. "Every European final I've been in I've won a medal," he said. "The world level is a different game but I'll be confident now next year that I could challenge." 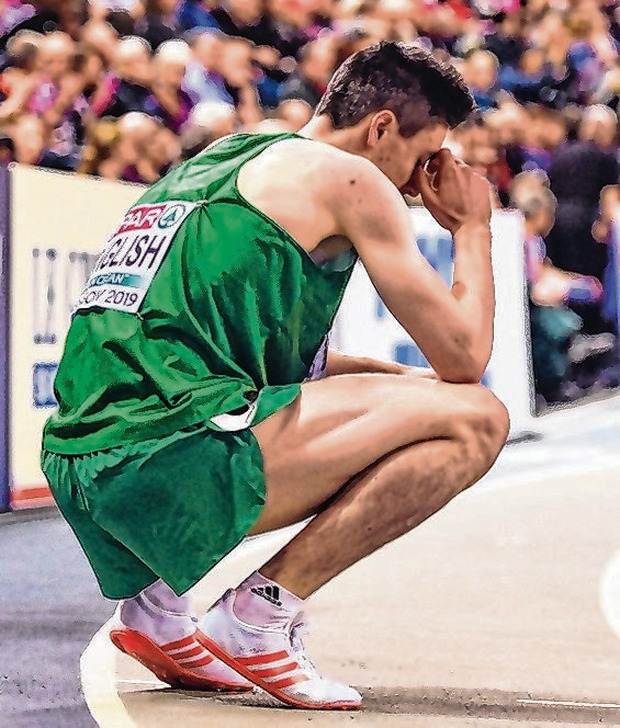 For Mageean, the journey back to a European podium took two and a half years, one coaching change, a countless number of miles and a one-way ticket out of Ireland. Since moving to England in November 2017 to work with coach Steve Vernon at Team New Balance Manchester, the signs were there of a career rekindled. 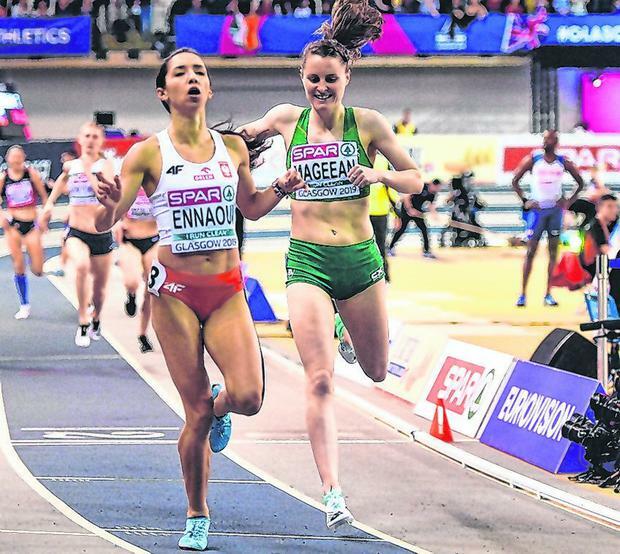 She cruised quietly along towards the back of the field in last night's 1500m final as race favourite Laura Muir churned out a steady early tempo. When the gears started turning with three laps to run, Mageean slotted in behind Poland's Sofia Ennaoui to ignite the battle for silver, and on the final lap - with Muir a distant leader - she sling-shotted past the Pole. It was a run that wouldn't quite carry her to silver, Mageean overtaken near the finish, which she crossed in 4:09.43. "I came in with the aim to win a medal and a part of me is annoyed that I didn't win a silver, but if you asked me whether I would win a medal months ago I would say 'yeah, I'll have that,'" she said. "I said I'm going to run my best race and walk off the track with my head held high - that's all any athlete can do." She last wrapped herself in an Irish flag in 2016, but since then had faltered at many a major event, reduced to tears after under-performing for a variety of reasons. "I've had to pick myself up after too many championships but now I'm going to enjoy my athletics," said Mageean. "Other people can look at peaks and troughs but it's impossible to be on a peak all the time. Life doesn't work like that. My athletics career will be tough and the lows will be low, but my goodness the highs are high." She uttered the words with a delighted grin, wrapped in a tricolour and luxuriating in the feeling of being back in a place it seemed she might never again grace. But now she was back. So too English. Healthy. Happy. Fast. Fearless. Glistening in green. Brilliant in bronze.